A team effort at Cargill’s salt mine leads to reliability excellence. The primary goal in any industry is maintaining safe, reliable equipment. This involves getting the maximum uptime at the lowest cost of operation and extending the as-designed usable life. The fundamental cornerstone of this proposition is effective lubrication in concert with preventive and predictive maintenance tasks that are carried out in a quality manner. 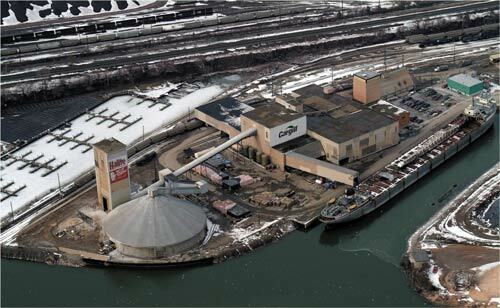 Performing required lubrication in a proper manner is challenging in even the best conditions, but at Cargill Deicing Technology’s rock salt mine in Cleveland, Ohio, the obstacles were considerable. 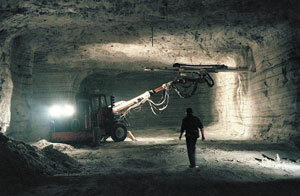 The mine is 1,800 feet deep and extends approximately 4 miles under Lake Erie. 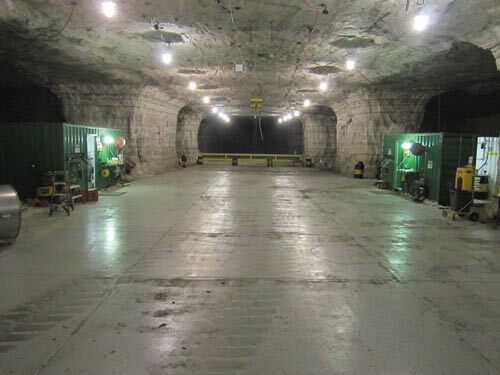 The underground mining operation utilizes a room-and-pillar style of mining, and its business is dependent on Mother Nature, since the primary product is deicing salt used for keeping roadways and sidewalks ice-free. The mine maintains a fleet of specialized mobile equipment that extracts the salt, which is transported on a conveyor system to the milling operation and then hoisted to the surface for distribution. Diesel-powered mobile equipment is used for the extraction process. These machines are high oil consumers that require 250-hour operational oil changes. extends approximately 4 miles under Lake Erie. The maintenance team made best-practice theories a reality by constructing a world-class, all-inclusive preventive maintenance (PM) facility, which is a unique installation for any underground mine. Considering all the challenges they had to overcome, the employees rose to meet and overcome those problems with very successful results, thanks in large part to having an engaged workforce and proper training. 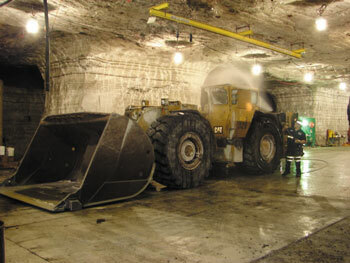 Approximately 10 years ago, the mining operation performed equipment servicing and PMs where the equipment was parked. All the material was brought to the machines, including filters, oils, drain pans, supplies, etc. Oil was transported in generic cans that were filled at a bulk station. The top of the can and equipment fill point were wiped off to keep dirt out when new oil was added to the machine. Waste oil was collected and poured back into the same cans to be dumped in the bulk waste-oil container, which was sent back to the surface for recycling. equipment was parked. Oil was transported in generic cans that were filled at a bulk station. Oil samples were taken, but maintenance personnel didn’t understand the value, since they did not receive any feedback and no actions were generated as a result of the samples. Once the oils were drained, there was an ongoing question of what product should be used for refilling. With so many issues at the mine needing improvement, the question was where to begin. It was determined that the best starting point would be to develop the knowledge base of the maintenance personnel. Part of this development was to have each mechanic attend a three-day lubrication course, which was conducted onsite. This helped provide the fundamental understanding that every component requiring lubrication needs the correct lubricant applied in the correct manner in the correct amount at the correct time. When these four principles are followed, equipment can last almost indefinitely. 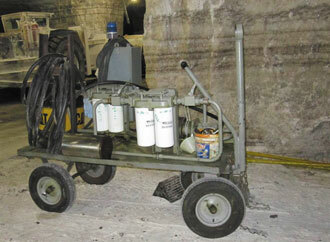 equipment that extracts salt from the mine. Of course, acceptance is not always easy when conducting this type of training with long-time employees. About a week after the training, one veteran mechanic requested a lubricant specification book because he believed an incorrect lubricant was being used for an application. This was a major accomplishment. Having a highly seasoned employee requesting clarification meant he not only understood the class, but he also was applying what he had learned. This was a good first step. With a workforce that is engaged, employees execute what they learn when they understand why. Maintenance personnel soon began questioning current practices and believed they could make improvements, such as building a PM bay. Working with a maintenance supervisor, they decided what should be included in this area. They wanted to be able to perform PM inspections and kidney-loop filtration of systems, not just service equipment. With a plan in mind, the team started assembling the necessary components. A location near the shop was designated as the PM bay area, and construction soon began. Once completed, the PM bay featured all the necessities for oil storage, pumping and filtration. Safety items were added such as an overhead fall-protection restraint system when accessing the top of the equipment. and screens the salt into a usable product before transporting it to the surface. As the PM bay was put into use, employees became proud of their accomplishment. Although it was not much to look at, it was a major upgrade from what they had been doing. Functionally, the PM bay achieved its intended design of supplying clean, filtered oil to the equipment. More importantly, the improvement came from the workforce wanting to be more proficient. This created a culture shift. Performing PMs where the equipment was located became a thing of the past. Everything now came back to the PM bay, and workers performed PMs with greater care, which translated into better equipment availability. Mining is an ever-moving operation. As the mineral is extracted, the distance from any permanent location increases. Soon, the PM bay became one of those locations getting farther away. Moving equipment to the bay took longer, leaving less actual PM time. A suggestion was made to move the PM bay closer to the working face, which would mean more time with the equipment. This was a great idea, but it was a monumental task to disassemble the current PM bay and reassemble it in a new location while managing the required day-to-day maintenance activities. 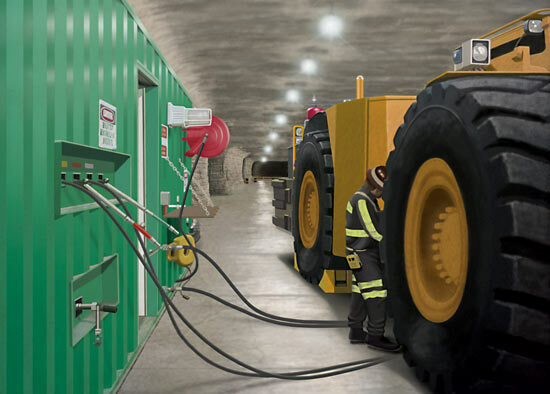 Then a question was asked: “What if the PM bay was portable so it could continually advance with the faces?” This began a quest to find a supplier that could build a rugged, portable lubrication containment for an underground mine. Storage cabinet for additional filters, tools, test equipment, etc. When the completed drawings were presented to the lubrication team, mechanics and apprentices, they were pleased everything was included and made only a few suggestions for improvements. This core group was truly engaged in the process. They made a difference, and their ideas were put into practice. They now not only had ownership of the lubrication containment but also enthusiasm in how they performed their work. featured all the necessities for oil storage, pumping and filtration. This enthusiasm was contagious, as others started making suggestions on how to improve the PM process. One idea was to have a level concrete pad on which to park the equipment when doing PMs. This would allow for proper oil fill levels and provide safer footing around the equipment. Another suggestion was to wash the equipment close to the PM bay in order to eliminate travel time. This posed several challenges, since water dissolves salt and keeping the PM area clean was a priority. One individual’s solution was to create a concrete-lined sump to catch all waste water from the washing process for recycling. This used water would be pumped into a containment tank to water roadways for dust control and improve ventilation. These combined employee ideas culminated into making the PM facility. The entire 40-by-160-foot work area was made of concrete, creating a safer work environment and improving PM quality. However, this was a major undertaking and required a lot of hard work. The concrete had to be lowered underground, transported to the site as a dry mix, mixed onsite, poured and finished by a crew of volunteers from the maintenance team. This illustrated their belief in the project and their commitment to making their ideas become a reality. to meet the needs of the mining operation. When mobile equipment is scheduled for a PM, it is now brought to this new facility. The equipment is first washed and moved 80 feet for lubrication servicing. PM inspections are then conducted on the clean equipment. Predictive tasks like oil sampling are performed using proper procedures and sample ports, and exhaust emission testing is completed. All issues that are discovered in the inspections are noted with a follow-up work order to repair or investigate the problem. 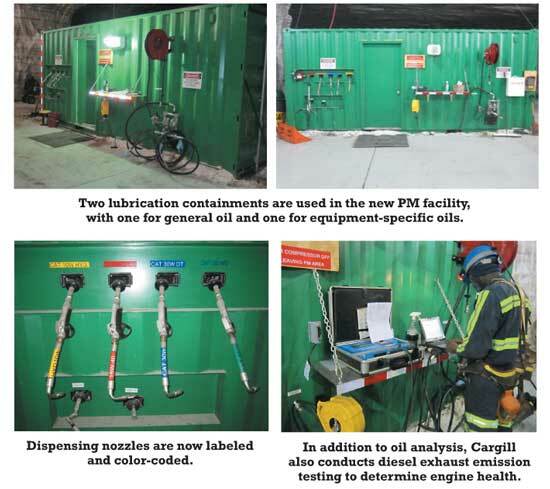 Two lubrication containments are used in the new PM facility, with one for general oil and one for equipment-specific oils. Dispensing nozzles are labeled and color-coded. Hose reels are used for all oil, grease and compressed air. There is a drop-down work area outside for completing paperwork or holding test equipment. Tanks are identified by name with color-coded labels. This minimizes the chance of filling a tank or dispensing the incorrect product where it does not belong. Each tank also has its own desiccant breather attached. There’s even a flat surface for completing paperwork. New oil is filtered with 10-micron, Beta-1,000 filters when it is transferred into the storage tanks from sealed 5-gallon cans. The oil is again filtered upon dispensing to ensure the cleanest oil goes into the equipment. All filters are equipped with a go/no-go filter bypass indicator. When the needle is in the green area, the filter is operating. When filters are in the red section, it’s time to stop and change the filter. This condition-based strategy of filter replacement maintains oil cleanliness while maximizing filter life to reduce cost. Each unit has a waste-oil pump that is plumbed to a 300-gallon waste-oil tank, which is behind the containment for easy replacement. One unit is equipped with a kidney-loop filtration system using the 10-micron, Beta-1,000 filters set up in a series with quick disconnects. Both units have pneumatic grease guns and fire-suppression systems that are sensor-activated. After examining its underground lubrication inventory, which was in excess of 60 different lubricants with several very similar products, the mining operation initiated a consolidation effort. 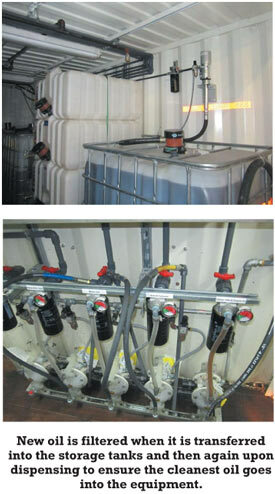 With the assistance of the lubricant provider, the team evaluated each application for correct product specifications and was able to consolidate down to 10 oil products and two grease products for mobile equipment plus an additional six oil products and one grease product to cover all rotating stationary equipment. A product application sheet for mobile and rotating stationary equipment was then developed. This color-coded, one-page sheet listed all mobile or stationary equipment and identified the product to use in each application. This significantly reduced inventory and cross-contamination while providing a quick reference for application. Without this consolidation effort, it would have been nearly impossible to build a lubrication containment with enough capacity to house all the different oils. 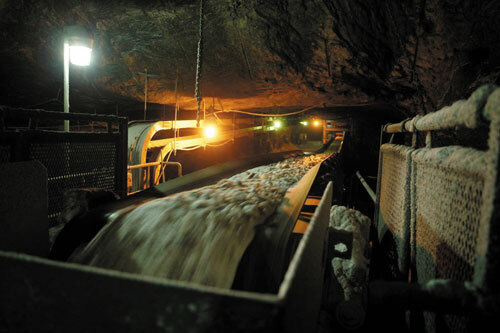 Although the mine’s maintenance personnel generally filled the equipment and gearcases, operators would top-off equipment when they performed a preoperational inspection and found a low oil level. Therefore, to make sure anyone adding oil to the equipment understood the consequences of their actions, lubrication training for some equipment operators and storeroom personnel was implemented. When attempting to become a world-class PM facility, it’s important to understand that improvements will not be immediate. They cannot be measured on this month’s metrics sheets or even in this quarter’s results. There must be a vision where progress is compared by years. Failures will not disappear overnight. Those failures are a direct function of current condition over time. Cleaner oil cannot compensate for a worn gear, bearing or pump but may decrease further damage. Early on, oil analysis may show a multitude of issues where you lose faith in the process. When components are rebuilt or changed, slowly you will see a trend of improvement. This requires determination and discipline to stay on course, especially when it seems easier to abandon the initiative. Reject the short-term view in favor of a long-term vision. For instance, if a new hydraulic pump with dirty oil can last six months, using clean oil and a long-term strategy may allow the new pump to continue efficient operation for five years, saving the cost and time of nine pump changes. Upon completing the training, one operator said he didn’t know oil was that important. He had been adding the wrong oil to his transmission. This showed he wanted to do the right thing but just did not understand why. Storeroom personnel were trained in lubrication practices because they were the first line of defense in ensuring the correct oil was being put into a machine. Before the training, when someone requested oil, storeroom personnel would fill the request. After the training, an oil request was met with the question of where was the oil going to be used. If the oil requested did not match the application, storeroom personnel would explain that was the wrong oil and then provide the correct oil. This was a great start to control cross-contamination and educate employees. The lubrication training also taught personnel the value of oil analysis and how to take proper samples. The goal was to make the oil analysis information meaningful. Each sample result would be reviewed when the lab report was received by email. Follow-up work orders would be written to address any anomalies. The results would be posted for all personnel to review. The lab would maintain a database on its Website of all current and historical analysis reports by machine number. Every maintenance employee would have the Web address, username and password with access from any work or home computer. This has made a significant improvement. The Cleveland mining operation has invested a considerable amount of time, money and manpower into improving its lubrication standards and developing a world-class PM facility. Was it worth it? The team is effectively trying to measure the impact by determining how many issues were prevented. Within the first month of operation, the identification and documentation of potential problems by craftsmen completing PMs increased 30 percent. Many of these described initiatives have reduced cost, improved equipment availability and increased productivity. However, while some things can be measured mathematically, others are not as obvious. For example, consider the direct effect an engaged workforce has on the results. Having the most technologically advanced systems will not necessarily gain improvements without a workforce taking ownership and pride in their accomplishments. This highly skilled and engaged workforce knew how to work as a cohesive team to foster successful results. The old adage that grease is grease and oil is oil may have worked 50 years ago but no longer applies. Personnel must develop a healthy respect for the complexities involved with proper lubrication practices. The basics of workforce development can be achieved through education and training, while the willingness to execute will be anchored in engagement. The Cleveland mine has taken a significant step in maintaining its mobile equipment fleet in the safest, most reliable condition with the development, construction and implementation of a world-class PM facility. This was a tremendous team effort in the quest for reliability excellence.